The purpose of this article is to provide an overview regarding the impact of the FASB Accounting Standards Codification – Topic 606, Revenue from Contracts with Customers (ASC 606) on accounting for costs to obtain or fulfill a contract with a customer. In addition to the new guidance on how entities should account for the transfer of good or services to customers, ASC 606 also expanded disclosure requirements which specifically require qualitative and quantitative information about assets recognized from costs to obtain or fulfill a contract with a customer. Readers should note that accounting for costs to obtain or fulfill a contract with a customer is governed by ASC 340-40, which is a new standard under U.S. GAAP, created by FASB Accounting Standards Update No. 2014-09 (ASU 2014-09). ASC 340-40 is intended to eliminate diversity of practice in recording contract costs and includes comprehensive guidance on accounting for costs of obtaining a contract within the scope of ASC 606, and accounting for costs to fulfill a contract with a customer that are not within the scope of another standard. The following is a summary of the new standard. ASC 340-40-25-1 provides that an entity should recognize as an asset the incremental costs of obtaining a contract with a customer if the entity expects to recover those costs. Incremental costs are those costs that are incurred to obtain a contract with a customer that the entity would not have incurred if the contract had not been obtained, such as a sales commission. Costs that are incurred to obtain a contract that would be incurred regardless of whether the contract is obtained are recognized as an expense when incurred, unless those costs are chargeable to the customer regardless of whether or not the contract is obtained. A practical expedient is allowed such that an entity may recognize incremental costs of obtaining a contract with a customer as expense when incurred if the amortization period is one year or less. The costs that have been deferred should be amortized in a manner consistent with the timing of the transfer to the customer of the goods or services to which the asset relates. Entities should consider renewal options when determining the amortization period. Straight line amortization may not be appropriate. Entities should assess such assets for impairment. An impairment loss is recognized when the carrying amount of the asset exceeds the amount of consideration expected less the remaining costs of providing goods and/or services. An information technology consulting firm sells two-year service contracts to its customers for the maintenance of hardware, website hosting, and other related services. The services are performed evenly throughout the life of the contract. Contracts do not provide for any renewal provisions. Sales agents receive a one-time commission of $500 per contract sold. A sales agent successfully negotiates contracts with three customers during the month and in doing so, incurs $1,000 of costs for travel, food, and lodging. The firm also pays the sales agent a salary of $4,000 per month. The sales agent’s salary and the $1,000 costs for travel, food, and lodging are expenses that the firm would incur whether or not any contracts were obtained and, therefore, are expensed as incurred. The firm would record an asset for the $1,500 commission ($500 x 3 contracts) and amortize the asset over the life of the contracts. The entity may choose to record three separate assets of $500 for each contract or utilize a portfolio approach and record one asset of $1,500. Based on these circumstances, the contracts are similar and a portfolio approach was deemed appropriate. Assume the same facts in the previous example except that after one year into the two-year term of the contracts, the contracts are re-negotiated and the firm will only receive remaining consideration of $2,000. On the date of renegotiation, the asset’s carrying value is $750 and the costs to provide the services for the remainder of the contract are $1,500. The firm would recognize an impairment loss on the asset in the amount of $250 (expected consideration of $2,000 less costs of providing the services $1,500 = $500. Asset $750 – $500 = $250 impairment loss). In summary, in order to comply with the disclosure requirements of ASC 606, reporting entities need to adopt and apply provisions of ASC 340-04 on accounting for costs to obtain or fulfill a contract with a customer. Management will need to carefully evaluate facts and circumstances specific to each customer contract, and revisit existing policies on accruing and evaluating incremental costs incurred to obtain contracts. 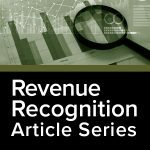 Do you have questions on the new revenue recognition framework, related disclosure requirements or incremental costs to obtain a contract with a customer? Selden Fox can help. For additional information please call us at 630.954.1400, or click here to contact us. We look forward to serving you soon.